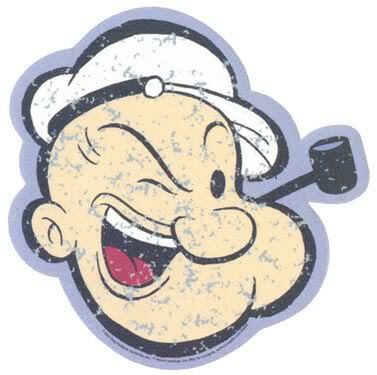 Do you ever feel like Popeye the Sailor Man? When he was fed up with being bullied by Bluto or just exhausted with life, Popeye would grumble, “I’ve had all I can stands, I can’t stands no more!” He would squeeze a can of spinach until it popped open, then eat the spinach and sometimes the can too. Instantly he would have supernatural strength to handle anything. Sometimes life is frustrating as we struggle through one battle after another. Sometimes even two or three at a time. Wouldn’t it be nice to have one of Popeye’s supernatural cans of spinach so we could have huge amounts of energy and strength to take on all the problems in our life? When the devil just keeps attacking our attitude, we could just grab a can and fight him off. When there just isn’t enough hours in the day, a can of spinach could give us extra energy to speed through the day. Yesterday was a Popeye’s spinach kind of day for me. Several situations in my life had me feeling overwhelmed, and then I found myself on the side of the road crying when the ball joints on my car broke collapsing the car’s body onto the tires. Nothing I would typically cry over. Just one more problem to add to the list. Later, I was able to see just how God had worked in the situation. Nothing happened to the car just a few days before when my family loaded up for a trip out-of-town. Nothing happened when I pulled out onto the highway in front of the many semi trucks that pass through our town. No one was injured. I was alone sitting at a stop sign rather than driving down the road. I realized I didn’t need a can of spinach because God was and is in control! What situation has you feeling frustrated, bullied, or exhausted? Are you saying, “I’ve had all I can stands, I can’t stands no more” and searching for supernatural strength? Psalms 34:19 says, “A righteous man may have many troubles, but the Lord delivers him from them all.” Even when I’m dealing with many afflictions, I am reminded of the strength not in a can of spinach but in my heavenly Father. Philippians 4:13 says, “I can do every thing through him who gives me strength.” I may feel like I’ve had all I can stand and I can’t stand anymore, but if I will call out to God, He will give me strength no matter how big the problems. All we have to do is call on him, and He will sustain us through every trial. Ephesians 6:10 says, “Finally, be strong in the Lord and in his mighty power.” He IS our can of spinach. Your reference to Psalm 34:19 brought a surprising image to mind: A phone call with a mail-order company. And the customer service rep assures me, “Your order is in the mail.” What’s my reaction? Relief. I may not have the package yet, but it’s on it’s way. How much more may I rest assured that God’s delivery WILL come! And just knowing that fact brings peace. Thank you, Tresa, for reminding us of our Father’s unfailing faithfulness! So true! I feel like saying that too often. Hopefully I’ll remember Philippians the next time! P.S. I’m popping through because someone left your link for me on Time-Warp Wife’s facebook page. It truly is amazing how God puts words of encouragement in our path just when we need them. I hope you’re feeling better! What a great point Tresa, and one we all miss more often than not. We don’t have the “big picture” our Heavenly Father does, so we can’t possibly know why things happen as they do. Thankfully, in times such as that we can be bolstered by our faith, knowing that God’s always in control, and has our best interests in His heart. I really don’t know how people make it through the difficult times without faith to give them strength! No matter what’s going on we can be encouraged in knowing that God can make good from anything. Hi Tresa~Isn’t it funny how God is taking care of us all the time and we don’t even realize it? We know He is…we just don’t always think about it until something happens and we realize how much worse it could have been. Thank You Lord for watching over Tresa and her family. You’re right Chelle. He is always there but unfortunately we don’t always recognize His presence and miss out on blessings sometimes. Thanks!